We believe you should have the power to choose when and how you receive your Honey news, which is why we've made it easy to customize your email notifications. Here's how. Navigate to your Notifications page. Click the gear icon at the bottom, lefthand corner of your screen. Select Account Settings from the menu. Select the Notifications tab in the page header. Set your activity email notifications. At the top of the page, you'll find activity-related notifications. These settings adjust whether you receive emails about other users' actions, related to your own. For instance, when someone comments or likes a post you wrote. You can toggle these email notifications on or off. If toggled on, you'll receive these emails instantly. 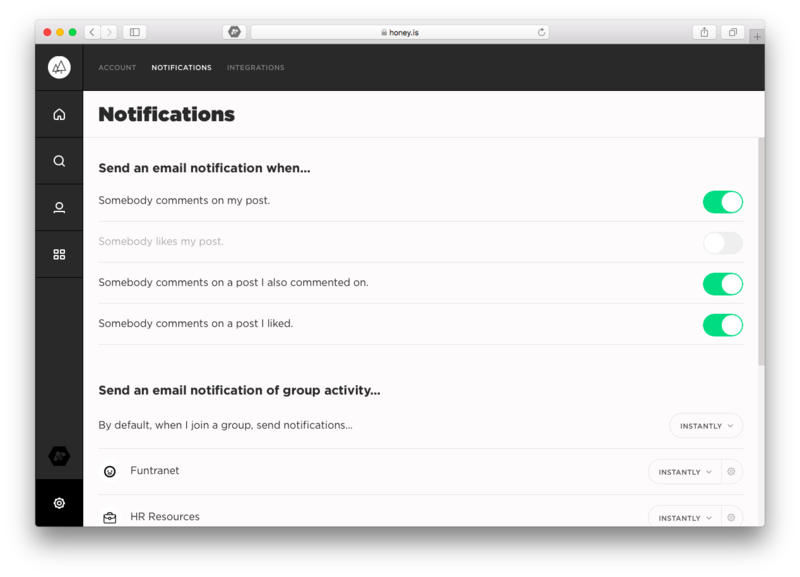 Configure your new post email notifications. The second half of your notifications page is dedicated to your new post notifications. In this section, you'll see a complete list of the groups you're a member of paired with a frequency dropdown that allows you to customize how often you receive updates from each group. Instant emails. When set to Instant, you'll receive emails as soon as a new post is published. Daily digests. When set to Daily, you'll receive a single email once a day that houses the most popular posts from the previous 24 hours in all the groups that you have set to Daily. Weekly digest. When set to Weekly, you'll receive a single email on Friday that houses the most popular posts from the previous 7 days in all the groups that you have set to Weekly. Never. When set to Never, you will not receive any emails when a new post is shared. Learn about the Important News digest. New users from the previous seven days. Your Important News digest ensures that everyone receives the most crucial information from the week. By default, the setting to send this email is toggled on, but Honey admins are able to turn this email off on their Admin>Organization Settings page. 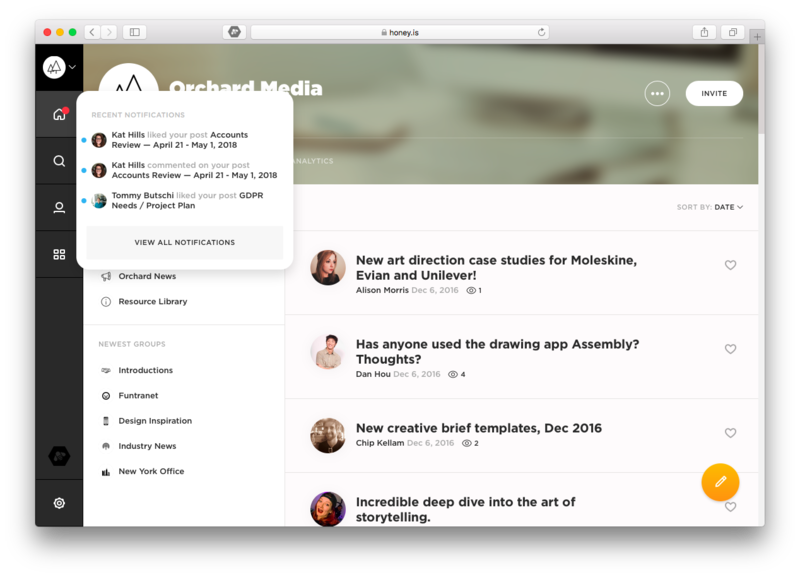 While you are in Honey, either on your desktop or mobile app, you will receive activity notifications in real time. They will display as a red dot on the home icon in your left hand navigation menu. Simply hover over the home icon to view your notifications. You can also view your previous notifications by clicking the home icon at the lefthand navigation of your screen. Then select Notifications tab in the page header.